What you need to know about staying in hostels. When you hear the word “hostel” this might conjure up images of chainsaw-wielding psychos from famous horror movies or a place for the homeless. Well, in New Zealand, hostels aren’t THAT bad. In fact, hostels are the most popular budget accommodation option for travellers. If you have never stayed in a hostel before, then this guide will tell you the dos and don’ts of staying in a hostel, as well as telling you exactly what is a hostel. In this beginner’s guide to backpacker hostels, we’ll explain what is a hostel by telling you what to expect in each type of room. We feel this is the easiest and best way to understand what a backpacker hostel establishment entails. What happens when you check into a hostel? We told you this was a beginner’s guide! And we’re starting from the basics: what happens when you check into a hostel. Once checked in, you will be given a key or key-card to your room. What is a hostel dorm room? The most common room-type in a backpacker hostel are the bunk rooms or the dorm rooms. Dorm rooms usually range from 4 to 10 beds either as bunk beds or single beds in one room. Beds almost always come with linen and bedding. They will also have a no sleeping bag policy. However, the odd hostel around the country will offer beds at a cheaper price with no linen, or linen will be available to hire. Who stays in backpacker dorm rooms? When you book yourself into a dorm room, you book yourself into one bed of that dorm room, while the rest of the beds will be occupied by other backpackers. (Or they will be empty if it’s a quiet hostel – you never know). While most hostels have mixed rooms, meaning dorm rooms for males and females, some hostels offer the female-only dorms. Rarely, there are male-only dorms too. What facilities are in a dorm room? Most dorm rooms only consist of the beds with linen and no other facilities. However, sometimes they might include an en-suite shower room and toilet, lockers, luggage storage, a rubbish bin, table and chairs. What is the price of a bed in a hostel dorm room? If a hostel offers multiple sized dorms, then the more beds in a room the cheaper the price, with a 4-bed dorm being the most expensive. 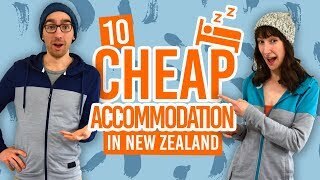 Dorm rooms can range from anything between NZ$20-35 per person per night. Almost all hostels offer private rooms in New Zealand. Most private rooms are double rooms (have a double bed). However, hostels also may offer single rooms and twin rooms. Private rooms in hostels will have the bedding and linen provided and made up. Often, private rooms also come with a towel and soap. They may also have a rubbish bin, luggage storage, an en-suite shower and toilet, tea and coffee-making facilities. What is the price of a private room in a hostel? When you book a private room, you get the whole room to yourself. The cost of a double or twin room is usually between NZ$60 and NZ$85. A single room, when available, is more likely to be around NZ$50-NZ$85. For these prices, we recommend also considering other forms of budget accommodation when staying in private rooms. Take a look at Staying in a Private Room: Hostel, Motel or Hotel? for a comparison. Now let’s move onto the communal facilities. Every backpacker hostel in New Zealand will have a communal kitchen, which gets a lot of use from hostel guests. Cooking for yourself in hostels is one of the best ways to save money while on the road. Take a look at our hostel recipes for inspiration on what to cook using hostel facilities. What facilities do hostel kitchens have? The number one rule of using hostel kitchens is that you need to label your food. Most hostel will provide stickers and have a sign telling you what to write. It’s usually your name, room number and departure date. Common practice is to put your chilled food together in a plastic bag and label the plastic bag. There will be a separate food storage area for food that can be left at room temperature. Label this food in a bag too. The second rule of hostel kitchens is to wash up, dry and put away your dishes after you have used them. For more rules, check out How to Live in a Hostel. Where do you go to shower? For those of you who are not staying in an en-suite room, there are communal showers and toilets. Showers and toilets are separated into male and female bathrooms. Usually, bathrooms will be on the same floor as your dorm or private room. Showers and toilets are separated by cubicles, while there will be a row of sink basins with some mirrors behind – much like any public bathroom. There is usually a power outlet in hostel bathrooms for shaving or blow drying your hair. If hair dryers are not provided in the hostel bathrooms, then there is usual one to borrow at reception if you need it. Shampoos and soaps are not usually available in these shared bathrooms, so you should always bring all your own toiletries to a hostel. The first thing you see when entering a hostel is the reception (or some sort of desk). This is where you check-in and check-out of the hostel and go to for any questions. Hostel receptions are also booking agents for local activities and transport, so they are a good source to go to for more information about the local area. Some hostels may also run a job-finding service for those on a Working Holiday Visa. If you need an extra blanket during the winter months, change for the laundry, even an extra pillow, don’t be afraid to ask at reception. Plus, most hostels offer luggage storage so you can store your luggage before/after you have checked into the hostel. Hostel storage is particularly handy if you are doing a multi-day hike for instance. Sofas, TV, games… Backpacker hostels always have somewhere to hang out. They will often have a lounge area with sofas, tables, board games, a book exchange and more. They may also have outside communal areas too. The communal lounge is where many hostels differ, with some providing the basics to others going all out to keep backpackers entertained. Some, but not all, hostels have computers and Internet access. And some, but not all, hostels have either paid WiFi or free WiFi. (Although, it’s not always the best connection, so learn more about staying connected in New Zealand here). All hostels will have a laundry facility. This usually includes multiple washing machines and tumble driers. Sometimes, there will be a washing line outside to hang your wet clothes for drying. However, if there is no washing line, then you must use a tumble drier to dry your clothes, as hanging wet clothes in your room is generally not allowed. Machines will either be coin operated or you will need to purchase a token from reception. Don’t overfill the machines! Your clothes will not wash/dry properly if you stuff too many clothes in there. When you see a good laundry facility, use it! A lot of the washing machines and tumble driers in New Zealand hostels are a bit worn, so take advantage of a good washing machine when you see it. Some tumble drier will take a couple of cycles to dry your clothes completely. That’s just the way it is in some hostels with old machines.